The web today is comprised of trillions of links: links between websites, links within social media venues like Facebook and Twitter, and even links in email inboxes. Who links to a site and how they link to it is one of the most important factors that search engines rely on when ranking results. But how do marketers control this? Link building expert Eric Ward provides the answers. Sharing little-known techniques for link building via social media platforms, blogs, partnerships, public relations, articles, and more, Ward teaches marketers which link-building techniques will maximize the quality links that point to their site, allowing them to charm both search engines and customers and which methods to avoid. 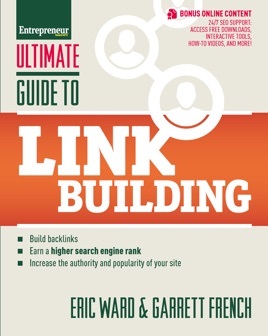 This one-of-a-kind guide details a variety of link building tools, tactics, and techniques illustrated by case studies, expert interviews, and resources. Ward leaves no opportunity unexplored, and no link-building questions unanswered.